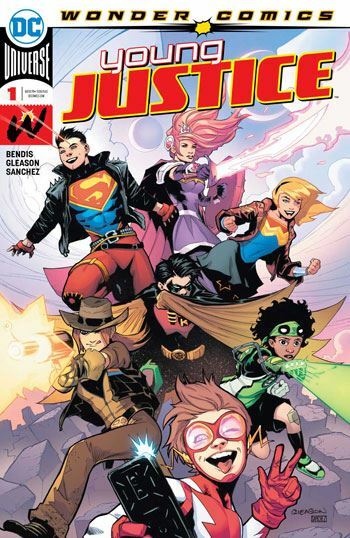 Young Justice returns with a vengeance. I loved that series, back in the day. It was reliably funny, good adventure, and had an excellent line-up of heroes, most of whom had fallen out of continuity in the last few years. But now they are back. Impulse, Wonder Girl, even the Superboy clone, joining forces with Tim Drake’s Robin. A new character, Jinny Hex, the descendant of Jonah Hex, adds to the mix, and all indications are that Amethyst will be part of the new group. So how can this be? Where have all these characters been since the New 52 ousted them? Well, I’m not sure. There are a lot more questions raised by this issues than answers given by it. I don’t really mind that, lots of time to make a good story out of the explanations. But aside from the intriguing comment about there having been seven Crises, there is much we are left to wonder about. The story is frenetic in its pacing, picking up the characters along the way, and assuming some familiarity of the reader with them. Perhaps a little more in the way of clear action and situations might have helped. But I admit that, when I finished my first read of the issue, I was so fanboy pumped that I didn’t really mind. I only spot the weakness looking through a second time for the review. I do have one major qualm. Bringing back these characters and talking about the reality manipulations that shunted them away is very déjà vu. I read this in Titans Hunt, and the first few issues of the Titans book that followed. I got all involved, eager that the return of Wally West was an indicator of important things to come, hoping it would tie into the other teases scattered throughout the DC Universe since Rebirth. But what became of that? Nothing. Wally West is dead again, and his big return was for nothing. The characters brought back by Titans Hunt were largely dropped from the book, and its promise was unfulfilled. So it’s a bit unnerving to see this playing out again, so soon. I see a lot of promise and potential here. Don’t squander it!